We are all impressed by the bravery of Malala Yousafzai. Her courageous response to an attempt on her young life, and her wonderful ambition to secure the right to an education for girls and boys around the world are unquestionably admirable. Even her completion of a book, with the aid of British journalist and author Christina Lamb, is admirable for the teenager. But kudos have already come to this Pakistani activist who, encouraged by her father, had already written a blog for BBC radio and won several awards for speaking out about education for all. But even after we finished reading I am Malala: The Girl who Stood Up for Education and Was Shot by the Taliban, we members of Writers as Readers book club weren’t entirely sure we really knew Malala. We were left wondering whose voice we’d heard in the rush to get her story into print. In our brief experience as a group, though, we’ve never had as lively a discussion as we did about this book. Our goal for WaR is to read a variety of books with an eye toward what we can learn for our own writing projects. Up to now, we’ve read only fiction, so taking on a non-fiction book was a new challenge for us. One of our key questions was how exactly to categorize the book. Not so much a memoir, it is more a journalistic report of what happened to Malala. We attributed that to the influence of co-writer, Lamb, a foreign correspondent for The Sunday Times of London, who traveled to Pakistan when Malala couldn’t return. Lamb interviewed Malala’s friends and family to help her piece together parts her life and to help her present the history of the nation and the Pashtun people of the Swat valley. We thought about the “Diary of Anne Frank” and “Zlata’s Diary,” both written by young girls trapped in war-torn countries, as was Malala. But those books really were diaries, and in the voices of the teenaged authors came through, even in translation. But Malala’s book, while it records some similar experiences and occasionally includes childhood concerns and memories, is not a first-person account of the same kind as the others. Malala’s memories are interrupted by the historical passages as well as by explanations the country’s tribal ties to Afghanistan, the influence of the Taliban, the politics of the nation, and her father’s struggles to build a co-educational school. Some of us thought those sections bogged down what we saw as the main story – Malala’s life before and after the attack that could have killed her. Several of us perceived differences in tone and pacing as the story went from the personal to the political that bothered us as readers. 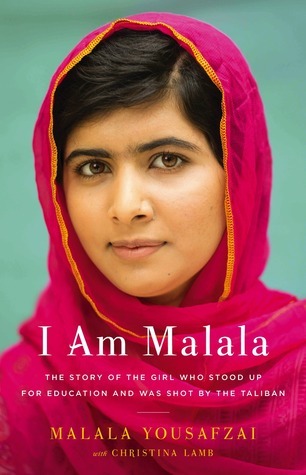 We wanted more of what we thought was Malala’s voice, her feelings and her own observations. But that brief quote is about the only thing we see of the diary in her book. We wondered how it might have read if it had been entirely a diary format instead of the more formal retrospective it is. We did learn in the book that it was customary for boys, who were the usual participants in the speaking contests that Malala entered, to deliver speeches written for them by others. Malala said her father wrote her winning speeches. She memorized and delivered them. Given that background, perhaps we shouldn’t have been surprised that she worked with an adult writer to create her book. At the end of our discussion, many of us walked out debating what the ultimate lesson was for us as writers. Maybe it was simply to emulate Malala’s courage in getting the task done under clearly more difficult circumstances than any of us face. The next book Writers as Readers will tackle is also non-fiction: The End of Your Life Book Club by Will Schwalbe. We’ll be discussing it at 6:30 p.m., February 4 in the Barnes and Noble store at CherryVale Mall.